As the league table starts to take shape with the marquee Indian Premier League moving into its fourth week, things have started getting serious in the tournament. And there couldn’t have been a better match to kick-off things this week than a humdinger between the Mumbai Indians and the Royal Challengers Bangalore. Fresh off their first win this season in 7 matches, the rejuvenated Kohli lead side will be looking to build on that momentum when they visit the Wankhede Stadium on April 15, Monday at 8:00 pm. Lead by their mainstays Virat Kohli and AB de Villiers, RCB finally broke off a 6-match losing spree and with it managed to evade the unwanted record of the longest losing spree in the tournament. A successful chase lead by a Virat Kohli half-century against Punjab sees them going into today’s match with a fresh approach to the league. 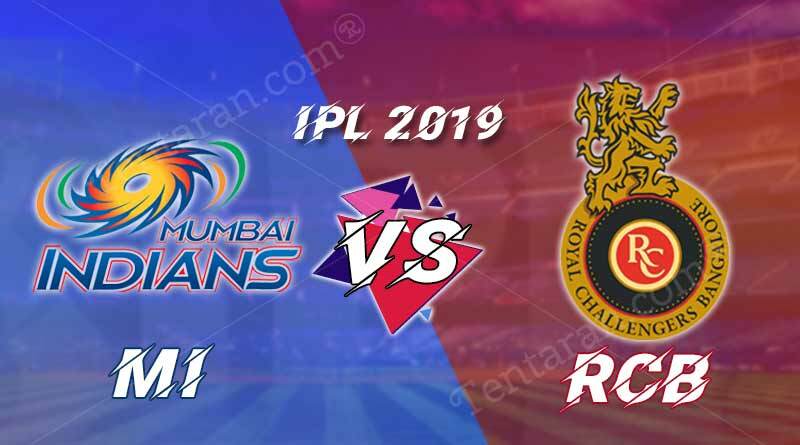 On the other hand, Mumbai was not as fruitful in their home match, losing against a languishing Royals unit that managed to peel past a massive target on an excellent batting surface where Mumbai just failed to put on the requisite runs. Ahead of this clash, the problems for both the sides lie in different departments. For the hosts, it’s a collective batting performance that has seen them not establish themselves as true title contenders with individual batting performances taking them to their 8 points rather than a well-rounded effort with the bat. After the opening pair of Rohit and Quinton de Kock, the middle-order is filled with flashy hitters, none reliable enough to build the foundation of an innings. On the other hand, RCB still have to settle in on their pace line-up. The inexcusable consistent selection of Siraj by Kohli is a perplexing one with the bowler consistently putting in treacherous performances to let his side down. As Dale Steyn comes in to replace Nathan Coulter-Nile, the side should be looking to give him a chance ahead of Siraj. The match is set to be one where runs will be scored at comfortable and relaxing ease. The side winning the toss will look to chase without a second doubt. It’s too tough to call but we expect MI to come out on top of this match solely on their bowling strength. Rohit Sharma (c), Quinton de Kock (wk), Suryakumar Yadav, Ishan Kishan, Krunal Pandya, Kieron Pollard, Hardik Pandya, Rahul Chahar, Jason Behrendorff, Jasprit Bumrah, Lasith Malinga. Yuvraj Singh, Siddhesh Lad, Quinton de Kock, Anmolpreet Singh, Anukul Roy, Pankaj Jaiswal, Aditya Tare, Barinder Sran, Rasikh Salam, Jayant Yadav, Ben Cutting, Mayank Markande, Alzarri Joseph. Devdutt Padikkal, Himmat Singh, Milind Kumar, Gurkeerat Singh Mann Umesh Yadav, Shivam Dube, Heinrich Klaasen, Kulwant Khejroliya, Tim Southee, Prayas Ray Barman, Pawan Negi. Rohit Sharma (c), Quinton de Kock (wk), Suryakumar Yadav, Ishan Kishan, Krunal Pandya, Kieron Pollard, Hardik Pandya, Rahul Chahar, Jason Behrendorff, Jasprit Bumrah, Lasith Malinga, Yuvraj Singh, Siddhesh Lad, Quinton de Kock, Anmolpreet Singh, Anukul Roy, Pankaj Jaiswal, Aditya Tare, Barinder Sran, Rasikh Salam, Jayant Yadav, Ben Cutting, Mayank Markande, Alzarri Joseph. Parthiv Patel (WK), Virat Kohli (C), AB de Villiers, Marcus Stoinis, Moeen Ali, Akshdeep Nath, Washington Sundar , Umesh Yadav, Navdeep Saini, Mohammed Siraj, Yuzvendra Chahal, Devdutt Padikkal, Himmat Singh, Milind Kumar, Gurkeerat Singh Mann Umesh Yadav, Shivam Dube, Heinrich Klaasen, Kulwant Khejroliya, Tim Southee, Prayas Ray Barman, Pawan Negi. The 31st game of the IPL between MI and RCB will be hosted by the Wankhede stadium in Mumbai today. For more articles like ‘Today IPL match MI vs RCB preview’, do follow us on Facebook, Twitter, and Instagram.